Denis Sheehy, an entrepreneur based in East Clare and in the GMIT Innovation Centre in Galway, has won this year's GMIT Spirit of Entrepreneurship ‘PitchComp' for his innovative Rainsavers product. Denis from Tuamgraney was one of three contestants to pitch their new product/services to a panel of four judges and a full audience in a Dragon's Den style competition in GMIT Mayo this week (Monday 16 September). The other contestants were Sorcha O' Grady (TruckScience) and Olive O'Connor (Minimate) - all based in GMIT's Innovation Centres in Galway and Mayo. Photographed at the GMIT Spirit of Entrepreneurship seminar at Galway-Mayo Institute of Technology (GMIT) Mayo campus, L to R: Jim Fennell, Head of the GMIT Mayo campus, Denis Sheehy, winner of the The PitchComp 2013, Joe Greaney of WestBIC, prize sponsor, and Helena Deane, Acting Manager of the GMIT Innovation in Business Centre. Photo : Keith Heneghan / Phocus. Denis Sheehy's business is called Cloudbrook Water Company (www.rainsavers.ie), an innovative design and manufacturing company that develops worldwide patented products which can take the rainwater from any roof and return it to your building as premium quality drinking water. "Now homes and business using our worldwide patented technology can tap into their own independent and renewable source of premium drinking water from naturally recurring Rainwater," he explains. "I'm delighted to have had the opportunity to pitch my business in front of an audience. All businesses that took part are deserving winners as it takes a lot of hard work and determination to start and develop a new business and idea. It's with the invaluable assistance offered to entrepreneurs by people such as Tony O Kelly, GMIT Innovation Centre, and programmes such as New frontiers and GMIT that help develop the potential of new businesses and the creation of employment in Ireland far into the future." Adds Mr Sheehy. The ‘Spirit of Entrepreneurship' event in GMIT was formally opened by Jim Fennell, Head of the GMIT Mayo campus where client companies in GMIT's Innovation in Business Centres (Mayo and Galway) displayed their products and services. L to R: Olive O’Connor of Minimate and Sorcha O’Grady of TruckScience, applaud Denis Sheehy of Rainsavers after he was announced winner of the Pitchcomp Challenge at the GMIT Spirit of Entrepreneurship Seminar at Galway-Mayo Institute of Technology (GMIT) Mayo campus. 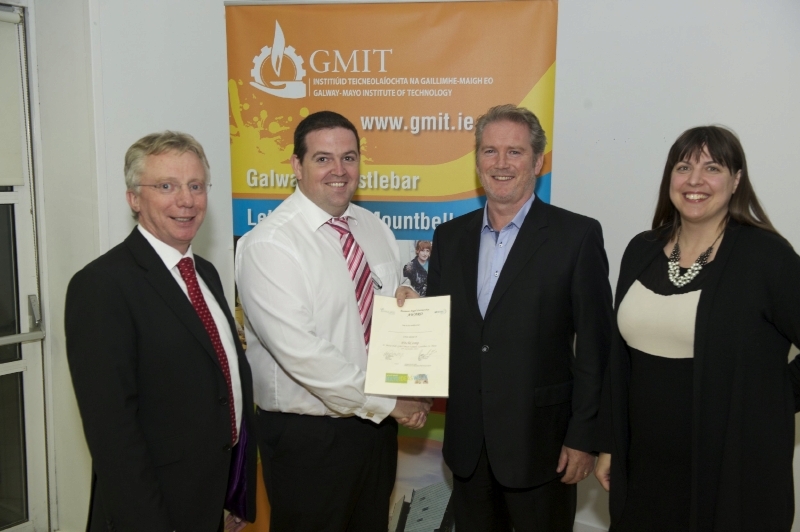 The three are client companies in GMIT’s Innovation Centres. Photo : Keith Heneghan / Phocus. Two leading Irish entrepreneurs Niall Harbison of Simply Zesty and Seamus McCann of ASTEC Global also addressed the seminar which was part of Mayo Ideas Week. Both entrepreneurs shared their start-up experiences and the many trials and tribulations along the road to success. Niall Harbison started out his career as a chef working for some of the world's most elite and celebrated restaurants and now heads up a social media and online marketing agency with co-founder Lauren Fisher; Seamus McCann is co-founder and Director of ASTEC Global Consultancy, a small private firm which now specializes in ICT, International Business Strategy and Finance in over 100 countries across many sectors. The event also saw the launch of an exciting and unique product for the retail sector called VBC Hologuide, launched by Visual Brand Communications, a client company in GMIT's Innovation Centre on the Mayo campus. The four judges of this year's PitchComp were Gerry Mackey, Director of BMW Region, Barry Egan, Director, Enterprise Ireland (West Region), Gerry Barry, founder of Fintrax and Laura Hill, Business consultant, Connaught Telegraph columnist and owner of the Castlebar O'Brien's franchise. Helena Deane, Acting Manager of the GMIT Innovation in Business Centre, says "We are delighted that the event attracted so many people as it also offered a range of information and advice on all supports and funding available to people in business and those starting out, as well as key information on the GMIT Innovation in Business Centre entrepreneurial supports." An Innovative Approach to OddJobs! Want to be a Successful Entrepreneur?